The ‘Semana Santa’, also known as Holy Week in English, is one of the biggest religious celebrations in the world. The most notable celebration takes place in the Spanish city of Seville from the 1st April to 7th April. The Semana Santa is considered to be the most important event of the year in Spain and both Holy Thursday and Good Friday are now bank holidays in Spain. During the Semana Santa celebrations, people flood the streets, whether they are Seville inhabitants or world travellers. Between Palm Sunday and Easter, beautiful and solemn processions take place during the days, followed colourful and lively parties at night. Flamenco dancers dressed in typical costumes with a traditional music from Andalusia bring an incomparable atmosphere, for an unforgettable moment. As the most famous of all the Semana Santa celebrations, accommodation and flights for Seville books out months in advance. However, Camino Ways, the walking and cycling holiday specialists can ensure that you are part of these celebrations and that your trip is simply unforgettable. With Camino Ways, you can enjoy this wonderful week in the region of Andalucia. As part of this all-inclusive Holy Week offer, you will get the chance to walk the Camino de la Plata in Seville from the 1st April (Palm Sunday) until the 5th April (Good Friday). This one of a kind walking experience will finish in Monesterio which allow you to experience Good Friday celebrations in this pretty little town. 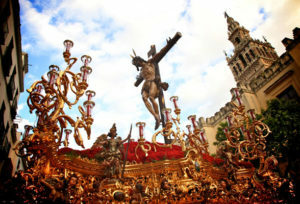 Once you have enjoyed all that Monesterio has to offer, you will then be transferred to Seville where you can enjoy Holy Saturday and Easter Sunday. This wonderful holiday with a difference can be yours from just €850pps, or from €950 for a single, with Camino Ways. Return airport transfers, luggage transfer from hotel to hotel, en-suite rooms, half board accommodation during the hike, a Holiday Pack (notes, maps, language book, what to bring, pilgrim passport), and transfer from Monesterio to Seville and 2 extra nights in Seville (Saturday and Easter Sunday).Please note, price does not include return flights.